The first day of Summer started out pretty much like any other orange house painting day with the exception of one incredible surprise!! The guys got here early to finish the painting and I opened the gates for them as usual. About a minute later they are at my front door to let me know a hawk had taken their ladders hostage! I just happened to have my iphone in my hand and hurried up and got a couple of quick shots and video (bottom of post) to be sure I didn’t miss my chance, then ran in the house to grab the 7D and my 100mm 2.8 macro lens. Oooooh was I glad the fledgling redtailed hawk decided to just chill there for a while! This is one of the babies who just left the nest and is fledgling….still dependent on mom and dad to feed them. We were able to coax baby off of the ladder and into our yard, trying to keep him from going over the fence where Barclay the cat was waiting on our awning!! Eeeek!! I’m not sure who would win that one….the hawk or the cat! Over the other fence a very large dog….so needless to say we were relieved he chose the safe haven of our wild back yard. I spend a lot of time inching closer and closer to “Cayenne” (dubbed by the painters who found him/her….thats the color of our paint) The hawk was not scared but seemed just as curious about me as I was about him. At one point I was within 18″ of this incredible beastie!! Those big beautiful eyes have 20/2 vision and are something I never thought I would have a chance to look that deeply into on a wild raptor!!! I have tears in my eyes just thinking about how beautiful he is!! Cayennne is a good color for “Cayenne”. This is my faveorite overall photo of this magestic creature. Look at those fresh new feathers!! “Cayenne” had moved on to my ivy patch and up into the back yard…thank goodness! Doesn’t he look much smaller out here? Reminds me in a weird way of a quail because his head is so small in comparison to his body. So far the baby hawk has been back and forth on my deck and porch swing. I sooooo hope that someday soon the sky will be graced by his soaring presence and shrill cries ….looking down on my garden as his home!!! Sigh…what a great day!! Oh, so lovely! Thanks so much for sharing this, Sandy! You were given a beautiful gift today! I love the close-up where his head is slightly tilted (5 up from the bottom photo). Hey you guys!!! Thanks a ton for stopping in to read about my hawk baby and for the comments!! Now I’m going to worry like a mother hen (hawk) until I’m reasonably sure this little one is safe and flying. The neighbor dogs are very aware he’s out there….UGH!! Oh Sandra, he is amazing what a great opportunity to see a young hawk at such close quarters, thank you for sharing such a great moment! Hi Sandra, what wonderful photos and what a joy to be blessed by such a magnificent bird in your garden. Hope that you can get him safe and flying, maybe he will come back to visit you ay the orange house. Hi Sandra, thank you for sharing this fantastic photos with us. You where very lucky to have such a young hawk in your garden !! YES…. oh gosh hope she will fly very high and away from dogs…. Shirin would chase him like crazy !!! Thanks so much for all your comments everyone!!! An update on “Cayenne”……I saw the parents yesterday soaring above my house and calling. They would then fly down below where I could see them , then back up in the sky again. My guess is they are either delivering food to their fledgling(s) on the ground or coaxing them up to the sky/trees….or hopefully a little bit of both! I havent’ seen the chicks since these pix but am feeling hopeful that they are still doing fine. 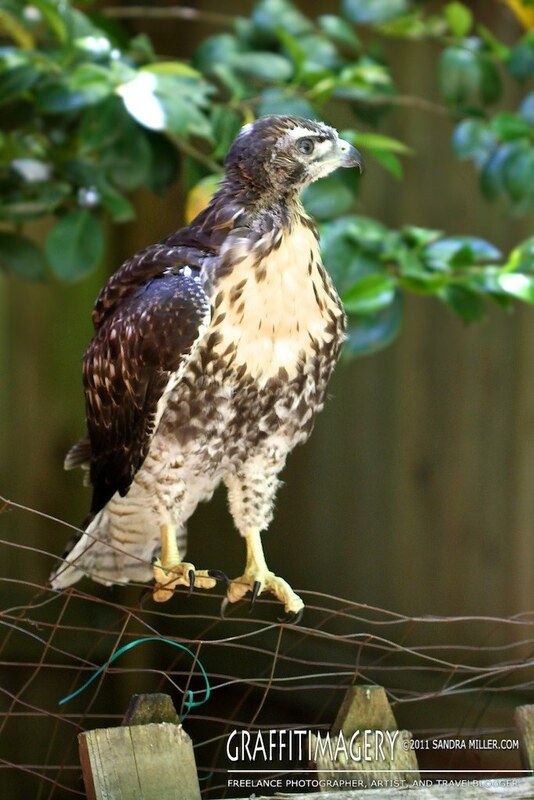 Hey Sandra, beautiful photos of the little hawk fledging ! I wonder where she ended up this season? ?